Purple Monkey is a custom builder of longboard skateboards from solid hardwood species matched with the best quality hardware available on the market to provide riders an unmatched cruising experience. Unlike any other board on the market, Purple Monkey boards are handcrafted, and the wood is personally selected to match the specific needs and desires of the individual rider. That said, Purple Monkey Skateboards are made to order. Solid wood boards ride like no other, and you will find once you’ve ridden Purple Monkey, there is no turning back. From boardwalk to boulevard, we guarantee you’ll to turn heads where ever you go. Purple Monkey boards carry a SPH speed rating (SPH=Smiles Per Hour). Support your local grassroots businesses. Veteran Owned and Operated. Contact us with your requests and orders. 1970s. SoCal. Inland Empire..the ocean not readily accessible and nothing but pavement to pound in the land of the endless summer, skateboarding offered the exhilaration of speed underfoot and freedom to express rebellious individuality. 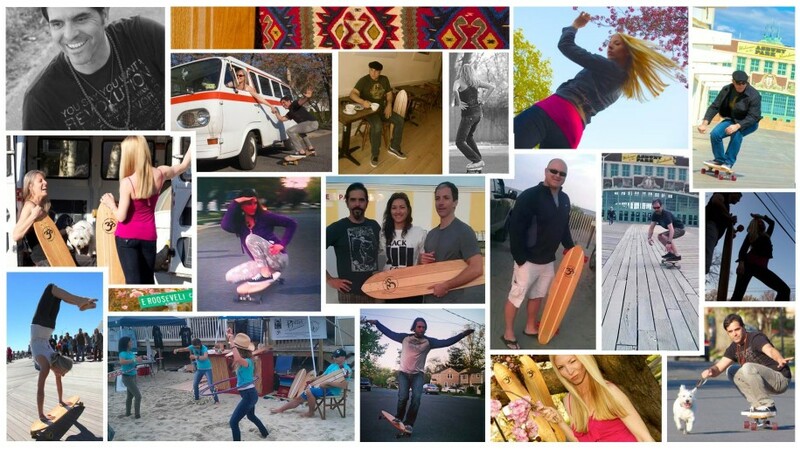 Health and Happiness are the cornerstones of Purple Monkey Skateboards. Founded by a circle of health minded friends, Purple Monkey is merely an extension of the pursuit of a healthy lifestyle. Yoga, Surfing, Laughing, Friends, Music. Skateboarding is sixth degree of separation. Everyone skates or knows someone who does.